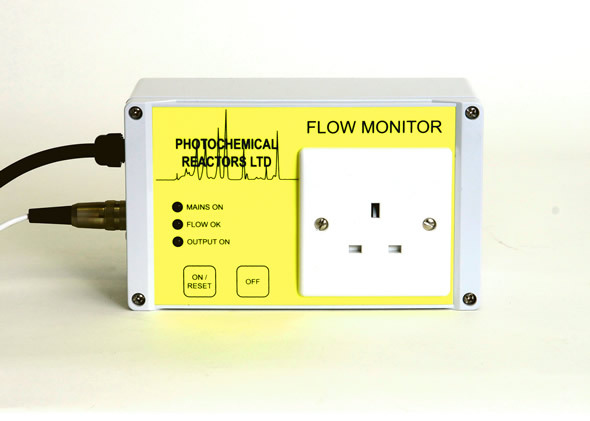 Photochemical Reactors Ltd offer a number of ways to protect the operator from the dangers of UV radiation. 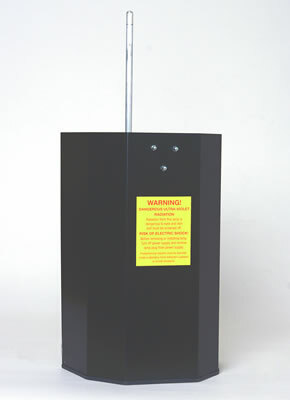 These include heavy duty metal foil to wrap around the areas that emit UV, also screens that block UV radiation, goggles and two part enclosures should ensure that all dangers are eliminated, at the same time giving the flexibility to carry out experiments. 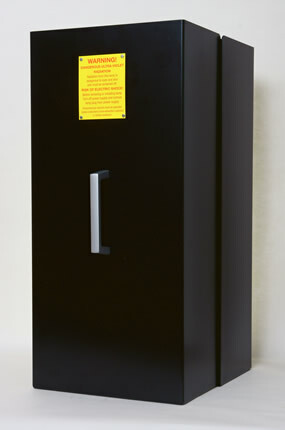 An enclosure cabinet is manufactured to totally enclose the components. 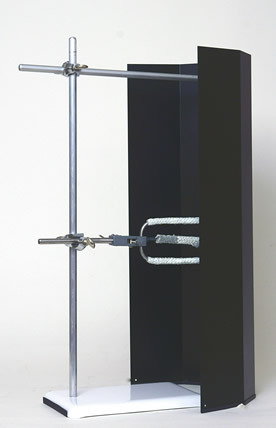 Access is through a door that is operated by means of an electrical isolation switch; the door can only be opened by turning off the power to the lamp. 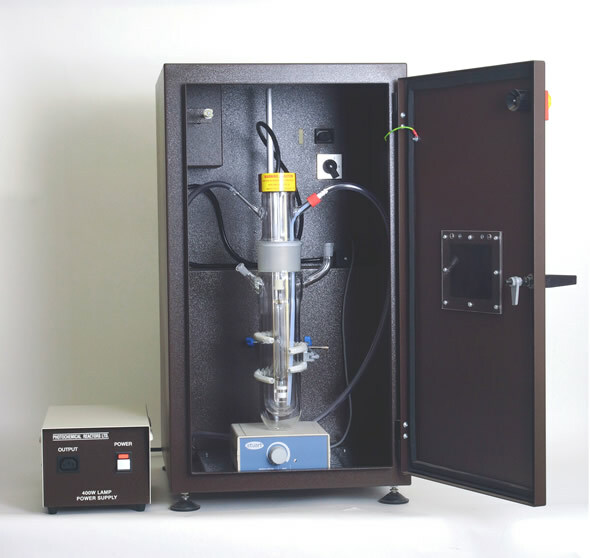 All components must be operated inside a laboratory fume extraction cupboard. 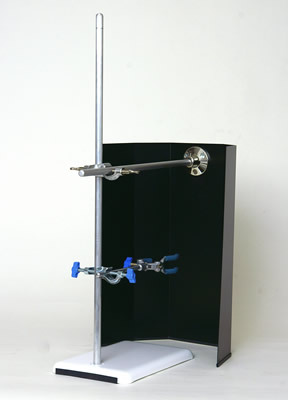 This flow monitor was developed as a safety device to be used with photochemical immersion well components, lamps, power supplies and immersion wells (cooling jackets). 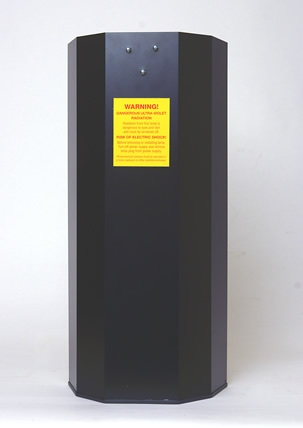 When the lamps are operating they are producing ultraviolet radiation, and also radiated heat – this heat must be removed to allow the lamp to operate at the correct temperature, and for the safety of the operators and their environment. 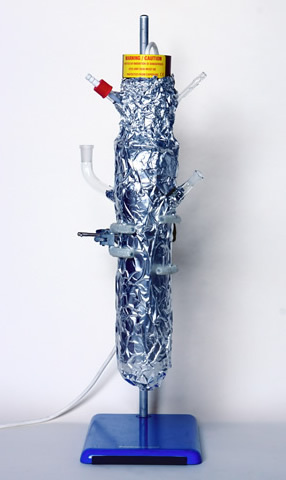 The heat is removed by passing water through the immersion well that contains the lamp. The power supply is connected to the flow monitor, and the flow monitor sensor is connected to the exit hose from the immersion well. If the cooling water stops flowing, an alarm sounds and the lamp automatically stops operating. When the flow monitor is first powered on the 'Mains On' LED will light and the 13A output socket will be off. 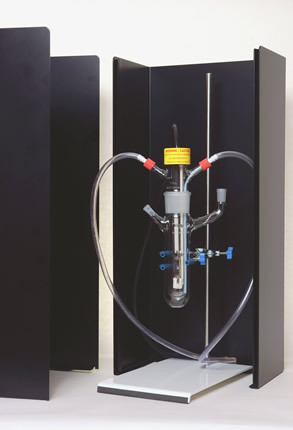 When the measured flow exceeds approximately 0.4 litres per minute the 'Flow OK' LED will light. If the measured flow falls below approximately 0.3 litres per minute the 'Flow OK' LED will extinguish. When the 'Flow OK' LED is on, the output can be turned on by pressing the 'On / Reset' button. 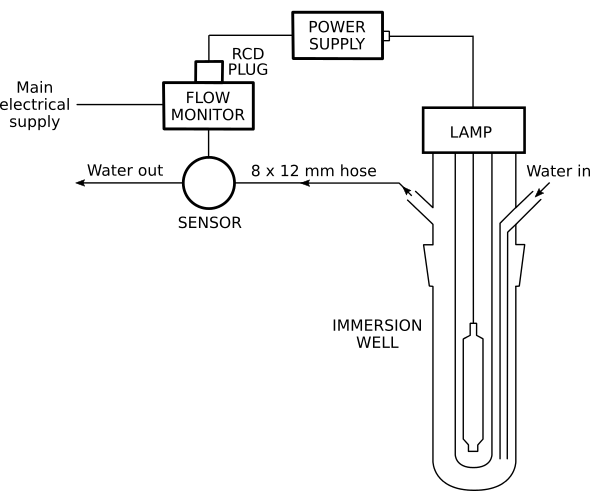 When the output is on, if the flow fails, the 'Flow OK' LED will go out and the alarm will sound. If the flow is restored within 10 seconds, the alarm will stop and the output will remain on. If after 10 seconds the flow is not restored, the output will be turned off and the alarm will continue to sound until the 'On / Reset' button is pressed. The output can always be turned off by pressing the 'Off' button. Note that the sounder beeps when a button is pressed.